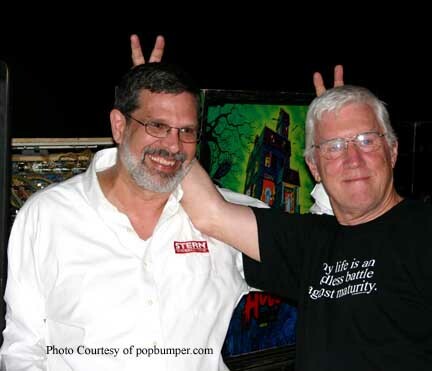 Thanks to The Pinball News for keeping me up-to-date first and free on pinball events! 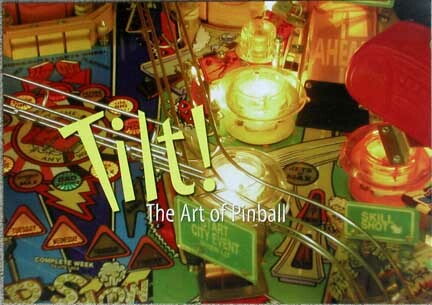 An exhibition of pinball art, titled "Tilt! 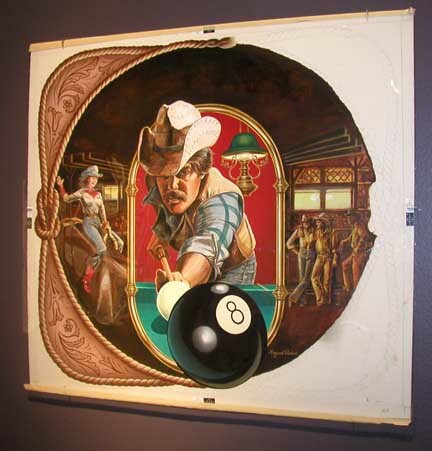 The Art of Pinball" is being held in the main gallery of the Mitchell Museum on the grounds of the Cedarhurst Center For The Arts in Mount Vernon, Illinois, USA. 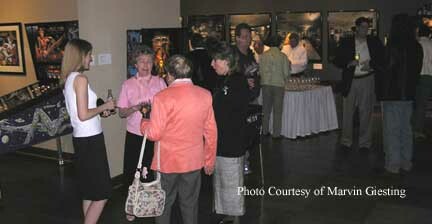 The exhibition opened on May 6, 2006 and will close on July 16, 2006. 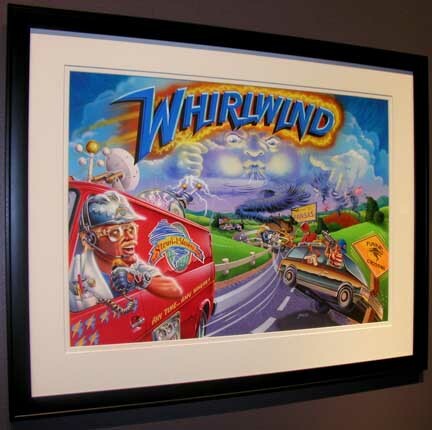 The purpose of their exhibit is to chart the (mostly Illinois') history of pinball by displaying machines from the 1930’s to the present and to feature original paintings and drawings of contemporary pinball artists. 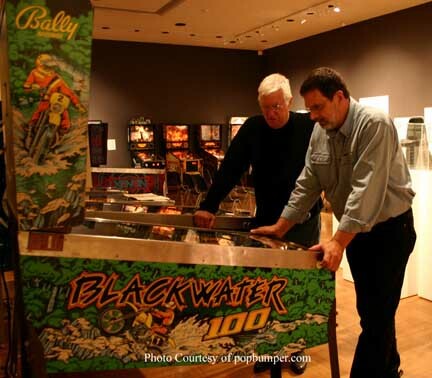 The idea of the exhibition belongs to David Gilmore, a professor emeritus in photography at Southern Illinois University in Carbondale, Illinois and a pinball collector/enthusiast. 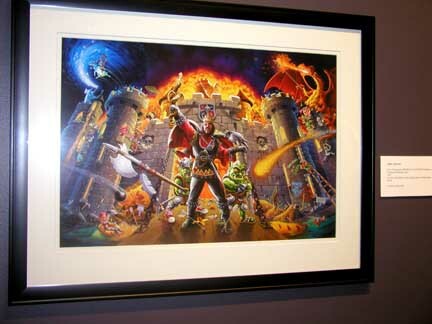 Art included in the exhibit is by John Youssi, Greg Freres, Margaret Hudson, Brian Rood, and Paul Faris. 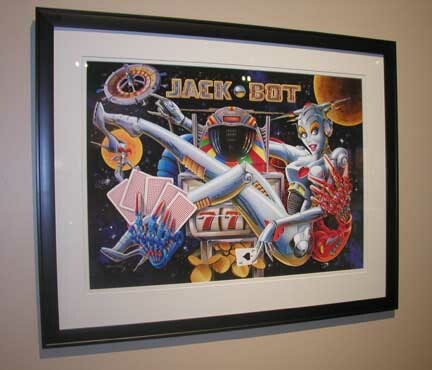 Pinball machine manufactures of the 40 games on display are Gottlieb, Williams, Stern, Bally, Midway, and Genco. 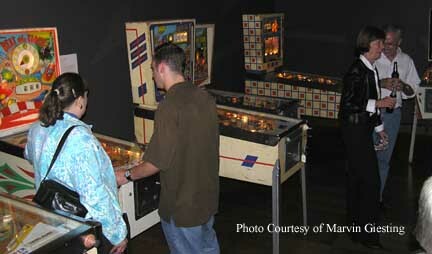 Games were loaned to the exhibit by Rich Grant, Marvin Giesting, Dennis Blankenship, Ken and Nina Hall, Rob Craig-popbumper.com, Brian Saunders Pinballs of the Past Collection, David and Jane Gilmore, and Richard Hammond. 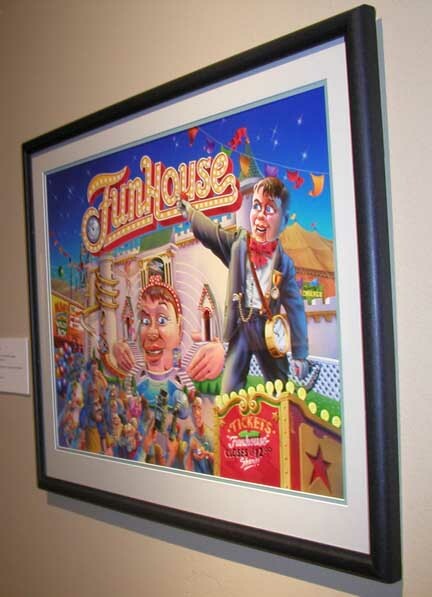 Except for the opening day premier, the exhibit is just that, a display of art and machines. Not all of the games will always be playable. If the loaner of the game does not want it played, it will not be turned on. 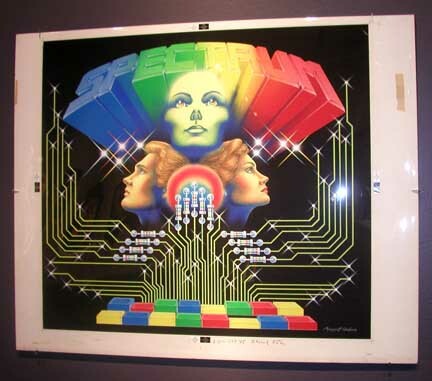 Kevin Sharp, the Director of Visual Arts for Cedarhurst, indicated that 4 or 5 varying machines will be playable, for free, on any given day. Photographing the exhibit is allowed. A tournament is being considered that would take place on some Saturday in June, contact Kevin Sharp (contact information is listed below) for more information. My wife and I live near enough that we were able to drive to Mt. 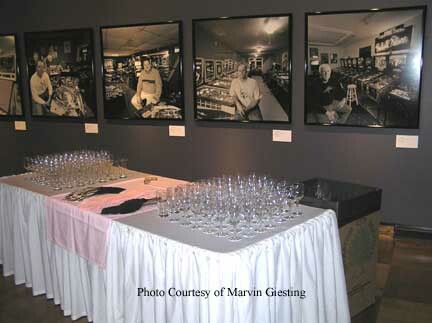 Vernon for the opening day of the exhibit. 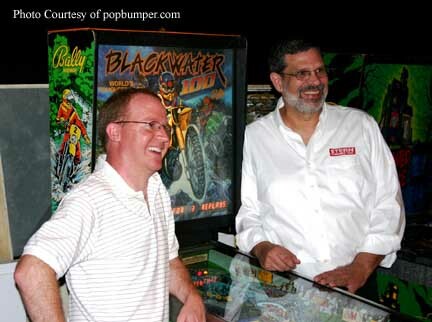 It began with a round table discussion about, you guessed it, pinball! 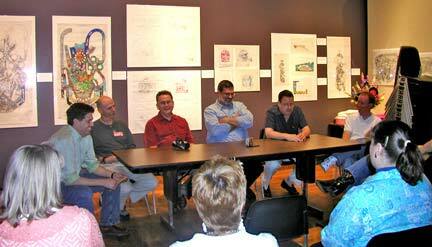 Panel members were Kevin Sharp, Director of Visual Arts, Cedarhurst, John Youssi, Artist, Greg Freres, Artist, Dennis Nordman, Designer, Rich Grant, Distributor and Collector, and Rob Craig, Collector and Restorer. It was very interesting and lasted a little over an hour. Audience questions were allowed. We attended the premier later that evening. 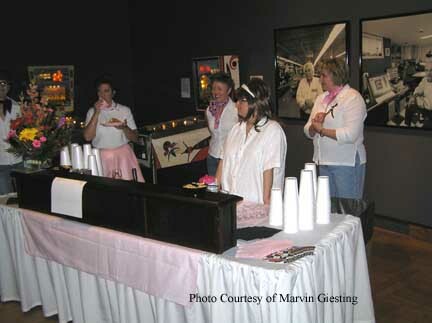 It was a fun event with a 50’s soda shop theme. 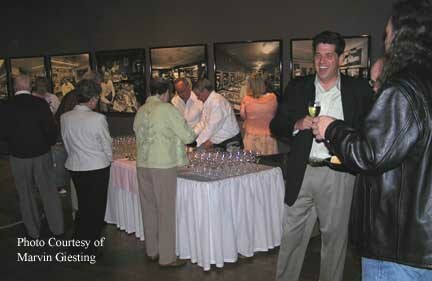 Wine, beer, soft drinks, and coke/root beer floats were served. Also available were hot dogs and your choice of condiments. I think I only had 3 dogs. 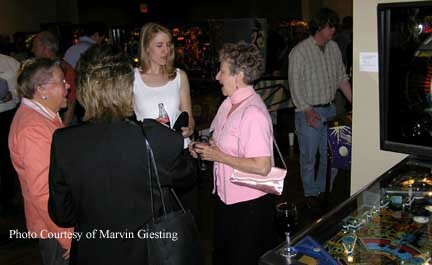 Some people were dressed for the theme as you can see in Marvin Giesting’s photos below. Thanks Marvin! 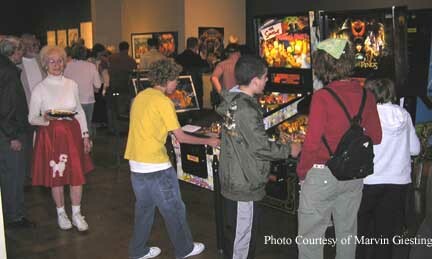 Most machines were ready for free play. 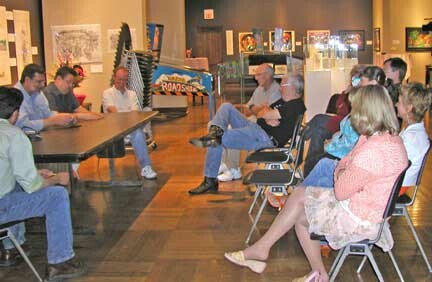 This event was well attended by museum patrons, the guest speakers, pinheads like me, and other interested people. 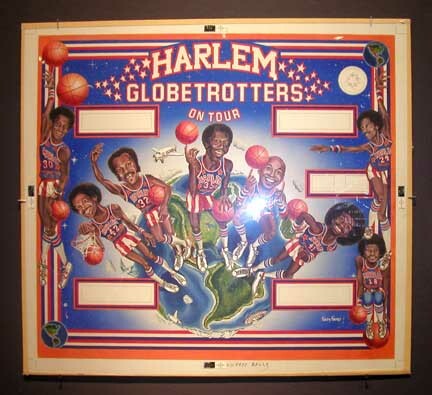 Even though I've never made it very far in any tournaments - age has slowed the reflexes somewhat and there weren‘t any tournaments when I was quick - some attendees were awed at my ability to manipulate the silverball. I helped a couple people find start buttons. 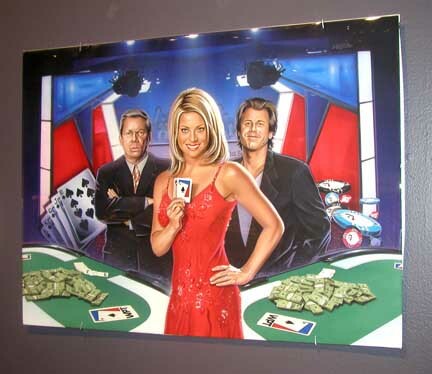 I helped one lady start the Revenge From Mars game but she was holding a drink so I worked the left flipper for her. I showed her, just once, how to catch the ball in the flipper and she performed the task at the next opportunity. Cool! Although this report is mostly pictorial, I met Rob Craig of www.popbumper.com at the affair and he told me that a video will be available from his website this fall. The video is currently in the development stage but should include at least the round table discussion and an overview of the exhibits. 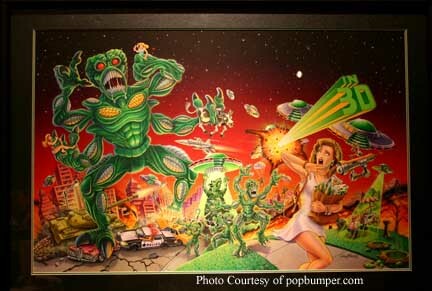 Contact popbumper.com in a few months for more information. The photographs below don’t do the art work justice. 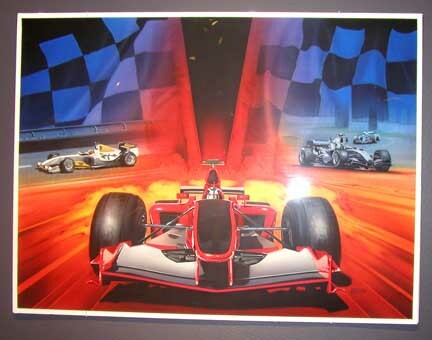 I can’t imagine the work required to produce these paintings. 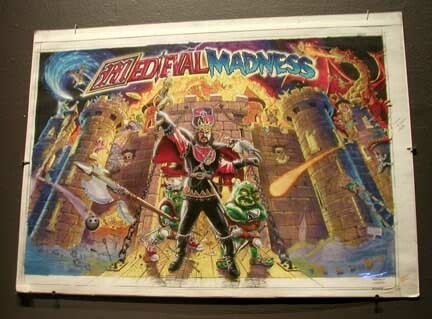 Previous to this exhibit, when I thought of pinball art I only considered the artwork that we see, (finished product art) such as backglasses, playfields, flyers, plastics, etc. 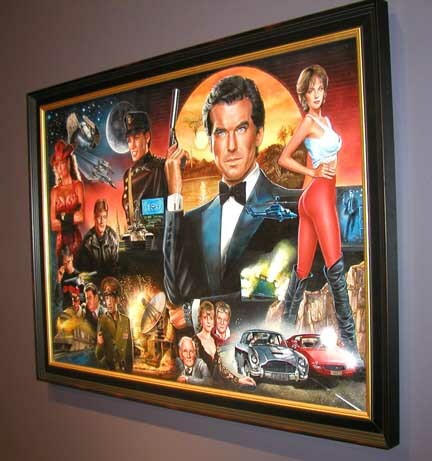 I never thought that they began with a “real” piece of art. 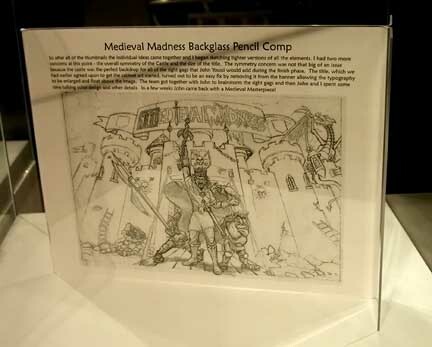 The exhibit also includes 'intermediate' work by the artists; concept sketches, notes, etc. Just a couple of those are included here. 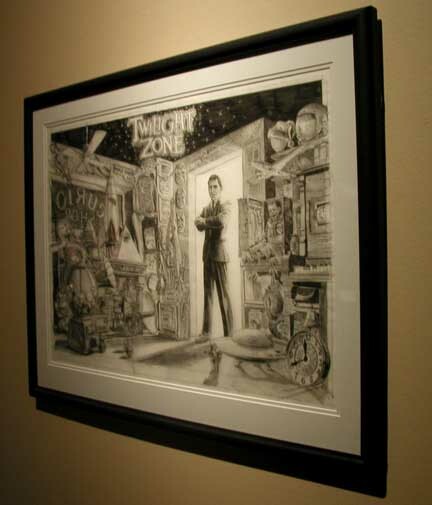 If you’re interested in the art you really need to go to Mt. Vernon and see the complete exhibit in person. 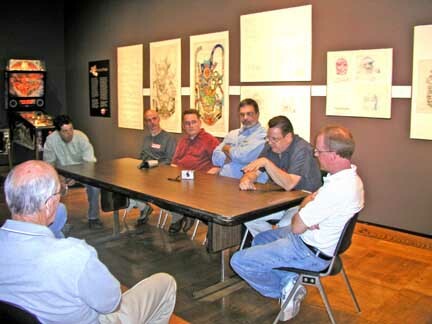 Thanks to everyone at Cedarhurst, the people that were able to take part in the round-table discussion, the people that loaned items for the exhibit, and to sponsers and co-sponsers of the exhibit. We had a wonderful time. The city of Mt. Vernon, Illinois is located about 80 miles east of St. Louis, Missouri at the intersection of I-64 and I-57. Directions in town are available on the Cedarhurst web site, General Information page. Admission: FREE! Although there is a donation box near the entrance. If you attend please help to $upport the efforts of Cedarhurst! Tuesday through Saturday they’re open from 10 AM to 5 PM. 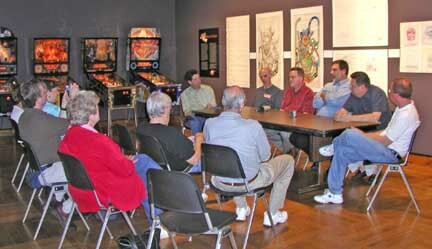 The event began with a round-table discussion. 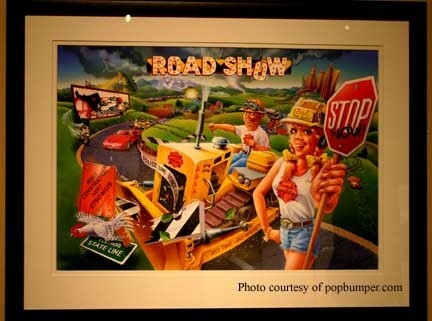 of actual "Road Show" art from beginning to end. A relatively small audience but I guess as expected. Most seats were filled. I was in one seat some of the time. I think they were asked to leave after this! 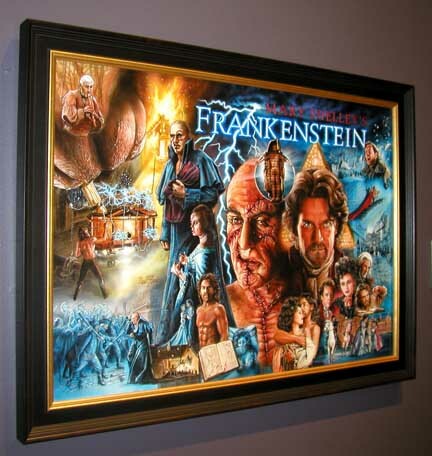 The art on display was amazing! 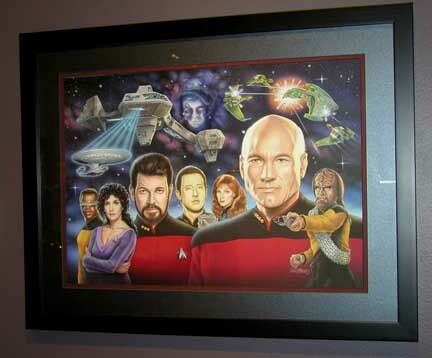 Acrylic, airbrushed acrylic, color pencil on cold press illustration board. 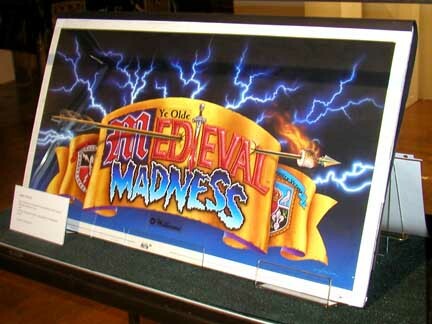 Acrylic and airbrushed acrylic on board. 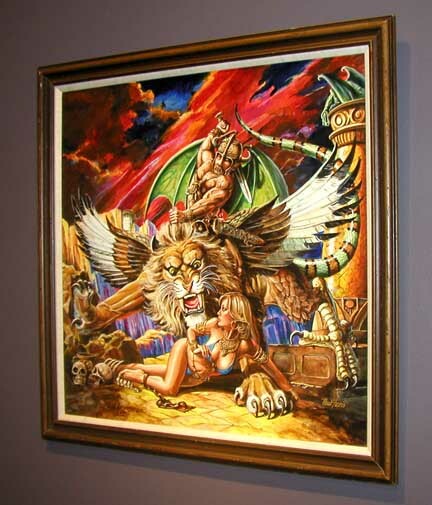 Acrylic, airbrushed acrylic, and gouache on illustration board. 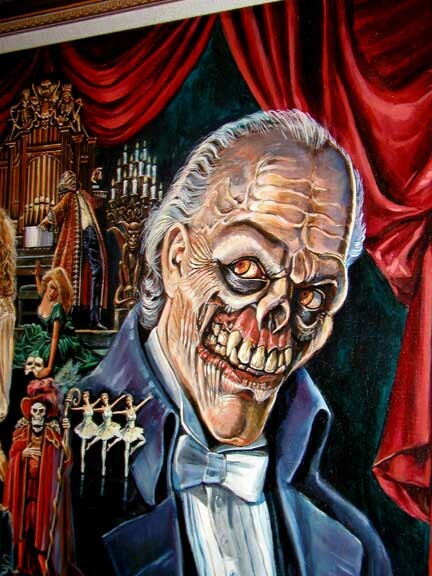 A bit of detail of the Phantom. 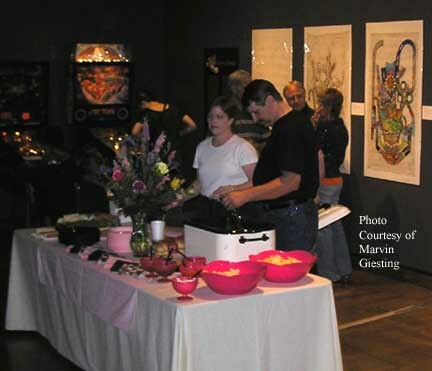 The exhibit will be open through July 16, 2006. 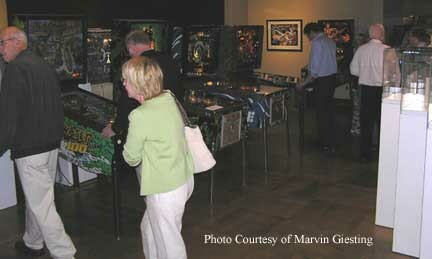 Judy and I think that if you're interested in pinball you'll enjoy the exhibit. Plan a trip or if you're traveling nearby, stop in Mt. Vernon, Illinois for an hour or so to see the exhibit.